It seems every day now, the news brings word of another man accused of using his power to abuse and harass women. Women you know (or you yourself) have probably made a #MeToo post on social media sharing experiences of harassment (or worse). To men who’ve been living in the privileged place of ignorance, the veil is being lifted, showing just how widespread this misogyny goes. I am a feminist. I believe that women and men are inherently equal, that we live in a world that treats women worse than men, and that we should work toward a world where people aren’t treated differently based on their gender. This shouldn’t be controversial, but it is. I live in a world, a country, a state, a city, where my daughters are going to be told that they are less. They are going to work harder than men for less pay. They are going to be told to keep quiet. They are going to be told it’s their fault when men stare. Their life experiences will be dismissed as exaggerations and hyperbole. My daughters are seven and ten, so while they haven’t yet started to get the worst of it, sexism starts early. Strangers in Target have commented on my daughters’ appearance. Boys at the playground tell them girls can’t be good at soccer. They see images of women that glorify the male gaze, and they see men who are accused of vile things being elected as our leaders. My wife and I have tried to steer our girls to media with strong female protagonists. From the animation of Miyazaki in My Neighbor Totoro and Spirited Away to the exploits of Tiffany Aching in Terry Pratchett’s The Wee Free Men to Ms. Marvel or Squirrel Girl comics, my daughters connect strongly with female characters. I can vividly remember the first time I showed Star Wars Episode IV: A New Hope to my older daughter. When Leia Organa grabbed the blaster in the detention level of the Death Star and started firing at Storm Troopers, my daughter exclaimed, “The Princess is saving herself!” I felt like I was doing something right. I try to model being a good man to my children. One way is to model consent. A firm rule in our house is, If you hear the word “stop,” you stop. Sometimes, my younger daughter enjoys being tickled by her dad. In the middle, she’ll say, “Stop.” I’ll stop, and she’ll look at me and say, “Why’d you stop?” And I answer, “Because you said stop.” “Oh. Okay. Ready. GO!” And the tickling resumes. The other day, my daughters and I talked about emotional labor – all the work that goes into relationship building and maintenance – and how, more often than not, it is a burden placed on women. I asked them what they wanted to do over their upcoming school break and they said, “I don’t know.” While I would be completely content entering into an extended break or long weekend with no plans, I know my wife wouldn’t enjoy it. If I end up spending a day (or days) playing Nintendo under a blanket, that’s A-okay with me, but that’s not fair to my partner. 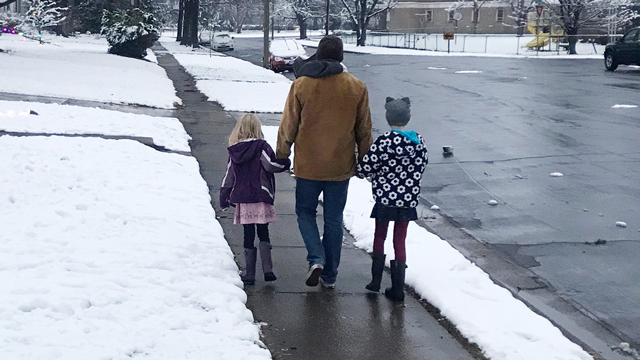 My daughters and I talked about how it takes energy and effort to make decisions and plans, and that if their mom is the only one who ever does it, she’s going to get tired of it. In a family, we should share that work and come up with things together. I told them that I’m still bad at this, I’m working to get better at it, and just give me one activity we can do out of the house together. We also talk openly about how sexism isn’t fair. How not that long ago, women weren’t allowed to vote and how ridiculous that was. How women and men are treated differently. How women earn less money than men for the same work. And how not enough women are elected as our leaders. I hope that as a man saying these things, the issues aren’t framed as a men-versus-women conflict, but as a justice-versus-injustice conflict. Kids have an innate sense of fairness. As young as they are, my daughters should be aware of and outraged by the place women have in our society. It’s an anger-worthy thing. But I’m just one imperfect man. I know the world won’t be magically made sexism-free in the precious few years left before they aren’t seen by the world as the children they still are, but as objects to be desired. They are going to go out into a world where I can’t possibly protect them. No parent can entirely protect his child from the evils of the world, but it’d be pretty nice if my kids didn’t have to deal with sexist men in addition to all the other bad stuff out there. 1. I will always listen to you. 2. I will always believe you. 3. I will never tell you what you’re feeling is wrong. 1. I will call you out on your sexism. 2. I expect you to call me out on my sexism. 3. If you treat women poorly, you won’t be in my life anymore. My daughters are going to have a harder time growing up in the world than I did, simply because of their gender. They will have to prove themselves in ways I never did. They will have to navigate individual acts of sexism in their lives and systemic sexism that dominates our culture. This makes me sad and angry, but it also makes me determined to be a better feminist man and a better dad to my daughters.